t started at science fairs. There, a young Catherine Price immersed herself in the world of living things, studying everything from sea urchins to the oxygen capacity of mice. Fast forward to today, when a lifetime of learning – and more than a decade of hard work – has led Price, Ph.D., an associate professor with a joint appointment in the department of clinical and health psychology in the UF College of Public Health and Health Professions and the department of anesthesiology UF College of Medicine, to launch a first-of-its-kind program to assess cognition and memory for people 65 and older before surgical procedures involving anesthesia. The Perioperative Cognitive and Anesthesia Network program, or PeCAN, represents a translation of years of research to a daily clinical practice. Researchers and clinicians have yet to fully understand how the brain interacts with surgery and anesthesia, Price said. She and others, however, have repeatedly shown that a patient’s cognition and brain integrity before surgery are indicators for postoperative outcomes such as delirium, cognitive change, and even mortality. For example, orthopaedic surgeons could expect a percentage of their older patients will have cognitive problems after total knee replacement surgery. But full acceptance of these findings was a long time coming. When Price tried to launch a program in 2005, she faced some headwinds. Administrators and clinicians required more evidence that baseline cognition and brain integrity predicted outcome, Price said, but these studies take considerable time and are expensive. The most convincing studies arguing the need for early monitoring and intervention are just now being published. “We encountered questions about why we were asking brain, cognitive and psychologically relevant questions to older adults patients electing knee surgery, hysterectomies, or cardiac surgery,’’ Price said. The team pressed on, and a breakthrough pilot study showed that 19 percent of patients would likely meet criteria for dementia. Previous studies had shown patients with dementia have higher rates of complications such as urinary tract infections, pneumonia and delirium, which increase the length and cost of hospital stays. Identifying these patients before surgery could reduce these complications and help ease the burden on caregivers. Price was now on her way toward establishing a program to assess a patient’s cognitive functions before they receive anesthesia. The PeCAN clinical service, which saw its first patient on Aug. 7, 2017, is based on a team approach and involves a partnership with the UF Health Shands Presurgical Center. Before major surgery, patients 65 and older are assessed for temperature, blood pressure, heart rate, oxygen level in the blood, attention and memory, and breathing. Now armed with PeCAN support, the presurgical center staff also require people age 65 and older to complete a three-word task and a clock drawing exercise, a classic assessment of dementia in which the patient draws a traditional clock face with all the numbers and set the hands to a specified time. If older patients have difficulty, they are referred to the PeCAN team. PeCAN clincial neuropsychologists then complete a 30-minute evaluation of cognition and memory, and provide feedback to the patient. If a patient has memory problems, such as that seen in early Alzheimer’s disease, the PeCAN team alerts the surgical and anesthesia providers that the patient may be at risk for delirium. Patient family members are informed about the delirium risk and are shown how to identify delirium. Geriatric medicine team members are alerted to visit the patient postoperatively and monitor for delirium. Additional PeCAN recommendations may include suggestions to the postoperative medical staff for how to communicate best with the patient, including speaking in clear, short sentences, chunking discharge instructions into groups, asking the patient to repeat back verbal instructions, and providing family members with written instructions. For patients who experience cognitive changes after surgery, PeCAN team members can conduct assessments for comparison and referrals to providers. In the short time it has been open, the PeCAN clinic has seen more than 800 patients who have failed these cognitive tests before going into major surgery. Approximately 12 percent of healthy patients will develop cognitive deficits post-surgery, and in most cases, these thinking and memory problems will resolve within six months to a year. Experts don’t know what causes postoperative cognitive changes, but it may be linked to an interaction between baseline brain status, aspects of surgery such as the length of the procedure, and type and amount of anesthesia administered. At an early age, Price became fascinated with brain-related behaviors. She focused on the neuron and its role in behavior, and a psychology of aging course fueled her interest. She threw herself into neuropsychology, studying what’s referred to as “the generation effect” in schizophrenia and working at an outpatient patient center for those with psychiatric disorders. After earning a Ph.D. in clinical psychology from Drexel University, Price joined the department of clinical and health psychology in the UF College of Public Health and Health Professions as a postdoctoral researcher. She was mentored by Dawn Bowers, Ph.D., a professor in the department, whom Price calls “a phenomenal force.” Price said Bowers helped her apply for and receive her first National Institute of Health grant to explore the connection certain brain vulnerabilities have to anesthesia and surgery. “I was struck with how poorly we (as a scientific community) understood this topic,” she said. Price tried to get a clinical program started to help lessen cognitive problems among older adults before surgery, but for various reasons it didn’t come together. She continued her work on dementia, revisiting the neuron while looking at white matter connectivity in Parkinson’s disease. She also learned about diffusion brain imaging techniques, cognitive profiles and how to measure brain changes relative to cognition. Then, with additional NIH funding, she led a team of medical and neuroscience colleagues studying brain and cognitive changes after knee replacement surgery. These led to recent publications inciting more evidence of change. With this knowledge, Price revisited her request to begin a program dedicated to protecting cognitive health in patients before surgery. The growing body of research in this area and other factors, such as the percentage of patients showing impairment in the preoperative setting who had no formal diagnosis of cognitive impairment, helped win approval to establish PeCAN. Price credits Kayser Enneking, M.D., a professor of anesthesiology and of orthopaedics and rehabilitation in UF’s College of Medicine, with the idea in 2015 of placing the clinic in the anesthesia preoperative service. Enneking later would write a letter successfully nominating Price for a Superior Accomplishment Award from the College of Public Health and Health Professions, lauding the program and Price’s tireless efforts. “In addition to all of her usual duties, Dr. Price imagined, developed and implemented a new program that can recommend personalized strategies to improve cognitive function in our patients after surgery. This program is singular in the United States,’’ she wrote. Price saw the need for her program to encompass all aspects of care so she established three cores vital to its success: research, a clinic and interdisciplinary training. The clinic is the key, assisting with the training by allowing for fluid communication among neuropsychologists, anesthesiologists and other young physicians. Since its inception, PeCAN has served as a way to train doctors who may not have experience treating cognitive disorders like dementia, said Patrick Tighe, M.D., the co-director of PeCAN and an associate professor of anesthesia and orthopaedics in the UF College of Medicine. Tighe is also an affiliate associate professor in the Warrington College of Business Administration’s department of information systems and operations management. Tighe said the research interests of the team of anesthesiologists, psychologists and nurses also help keep the program current on new discoveries and helps them incorporate these into the program. “I’m continually amazed at how the team is able to uncover so many potential threats to a successful postoperative recovery through their incredibly thorough evaluations,” he said. PeCAN has been welcomed by patients, as evidenced by the survey cards they have given to the clinic. Enneking added her own observations. Some of this newfound interest is being driven by the patients themselves. Older adults, she said, are increasingly seeking quality-of-life surgeries and have the highest rate of surgeries a year per age group. “Clearly, patients and family members are increasingly concerned about cognitive change and surgery. In the clinical service, we have had many patients and family members voice relief that this topic is now addressed,’’ Price said. As for the future of the program and its accessibility throughout the U.S., Tighe believes it should be the standard, citing UF’s clinic as the model. “This service will help ensure that cognition is not left as an afterthought in planning before surgery,” he said. Price echoed that thought, adding that despite all of the years it took to get to this point, the future looks bright for PeCAN and similar programs. It is a simple test, yet it tells clinicians so much about a patient’s cognitive health. The instructions are straightforward: On a piece of paper, draw the face of a clock. Put in all the numbers and set the hands to 10 after 11. A patient’s performance can give clinicians insight into a number of cognitive functions, including verbal understanding, memory and visuospatial abilities. “The reason why clock drawing is such a powerful test is not because of how well you do it, it’s because of the myriad ways in which you struggle and might fail in your attempt to do it,” said David Libon, Ph.D., a geriatric neuropsychologist at Rowan University whose research has identified clock drawing test errors associated with particular dementia syndromes. The test yields such rich information, Libon said, that his mentor, the late Edith Kaplan, Ph.D., a pioneer in clinical neuropsychology, used to say that if she was pressed for time and could give a patient only one cognitive test, it would be the clock drawing test. Now, researchers led by Catherine Price, Ph.D., an associate professor of clinical and health psychology in the UF College of Public Health and Health Professions, and Patrick Tighe, M.D., an associate professor of anesthesiology and orthopaedics in the UF College of Medicine, are using the clock drawing test in a novel way. In a new National Institute on Aging-funded study of older adults who are undergoing surgery, participants will use a digital ballpoint pen to complete the clock drawing test at various points throughout a year. Because the pen records data at a rate of 80 times a second, it can reveal subtle cognitive changes that the clinician would not be able to spot. Medical Center, developed the digital clock drawing test software, which is available through their company, Digital Cognition Technologies. Libon, Davis and Penney are also team members of the new UF-led study. For example, the digital clock drawing test is so sensitive it can perceive patient pauses that may only be fractions of a second long. If the pauses happen at phases in the clock drawing where many people typically do not pause, it may be an early indicator of cognitive change. 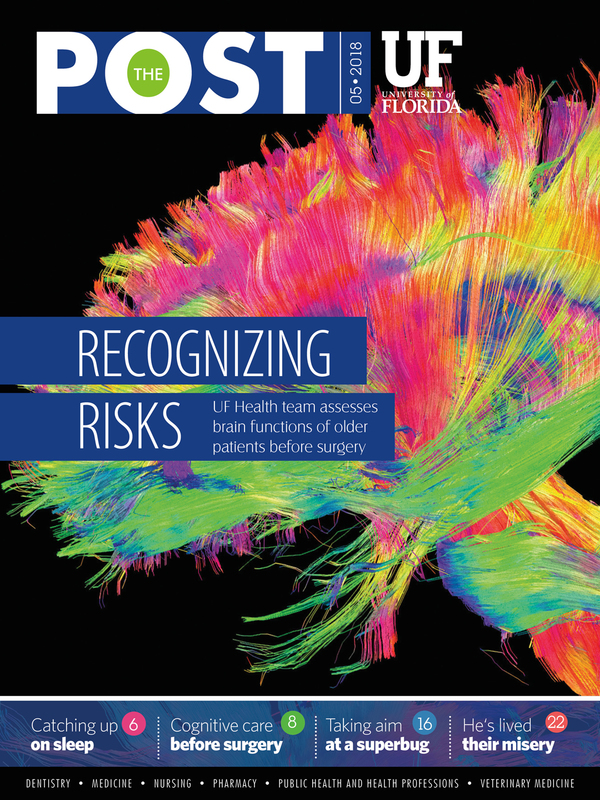 The UF study data will be analyzed with machine learning algorithms to identify which behavioral features predict postoperative complications and outcomes, such as length of stay, hospital cost and readmission rates. The goal is to provide an efficient and accurate tool that becomes part of routine clinical practice, Tighe said. “This study will help health care professionals identify and categorize patients’ cognitive difficulties that may influence decisions about the timing of surgery, surgical and anesthetic techniques, and postoperative recovery plans,” Tighe said.